Advertising encourages curiosity, curiosity encourages learning and learning encourages change. But to deliver the kind of information that fosters change, you need to be in front of a large number of people. Each month our research team identifies many of the largest opportunities in North America for companies selling to companies buying products and services for 960 new or expanding projects each year. These include senior living communities, seniors centers, hospitals, fitness and wellness centers, municipal community centers and YMCAs. To help you directly reach the decision-makers serving these institutions, ICAA identifies qualified sales leads to companies not only needing products, but actually intending to buy them. If you are an ICAA advertiser, Corporate Partner, Partner or Sponsor, you’re in. 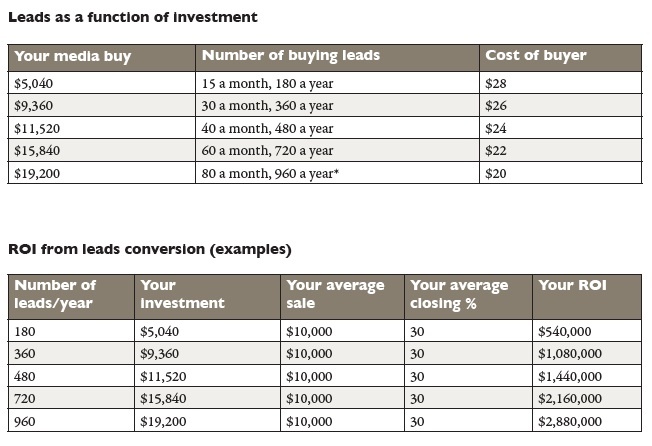 The Return on Investment chart below shows how many leads you receive from your media buy and, more important, how few you need to successfully act on in order to increase your sales. But act you must. When you do, great things can happen. Consider that if you close 30% of 960 leads, for example, and your average sale is $10,000, you will gain $2,880,000 in sales. In other words, for your commitment of $19,200, your cost of acquiring each sale is all of $67 – a pretty good ROI, wouldn’t you agree? A large sales staff could take months of door-knocking to achieve these kinds of results. We’re sparing you much of the legwork.